The position of President Emeritus is hereby established. 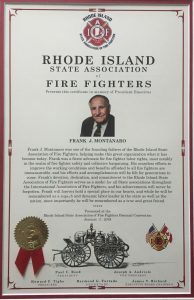 Such position is granted to Frank J. Montanaro immediately upon and concurrently with the effective date of his respective retirement as President of this Association. This position shall carry with it ex-officio lifetime membership in the Rhode Island State Association of Fire Fighters and automatic selection as delegate-at-large to each of its conventions. The position of President Emeritus is hereby granted to Paul C. Reed immediately upon and concurrently on the date of his retirement from this Association, effective January 11, 2018. The position of Secretary-Treasurer Emeritus is hereby established. Such position is granted to Robert M. Lavin immediately up and concurrently with the effective date of his respective retirement as Secretary-Treasurer of this Association.